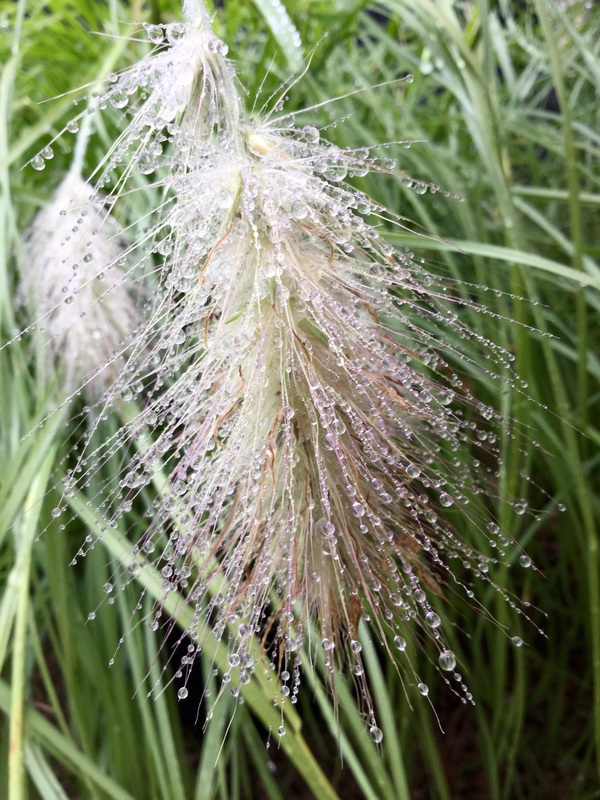 Pennisetum macrourum : perfect picked, dried or simply left on the plant …. 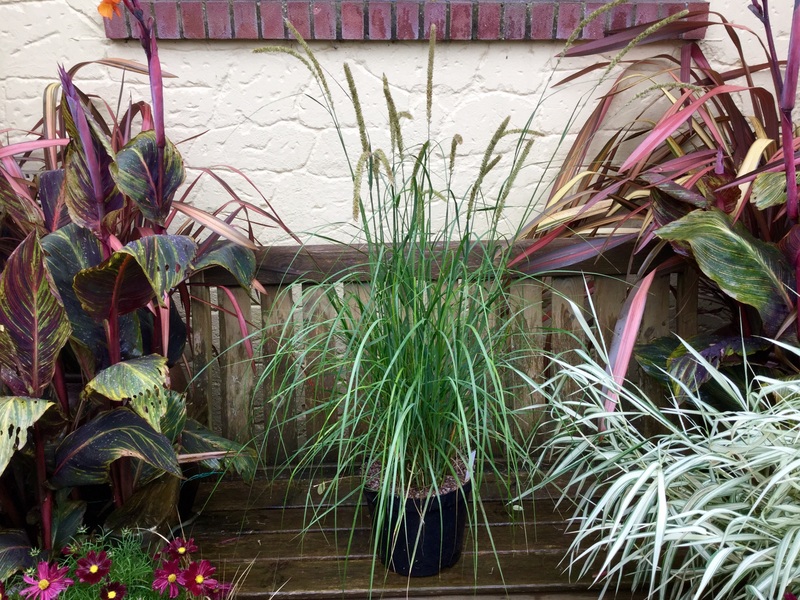 Pennisetum macrourum or African Feather Grass is a simply stunning plant, I bought two in September 2011 from Knoll Gardens to remind Hitesh and I of a memorable day out with Roger Grounds. He raised a knowing expert eyebrow at my purchase, but wisely left me to work out what the gesture meant for myself. I was bewitched by the 6-8″ long cylindrical cat’s-tail-like flowers that are so soft and silky to the touch, opening a pale cream tinged with green, they age through to a pinky beige – they look great in flower arrangements whether freshly picked or in dried flower arrangements. 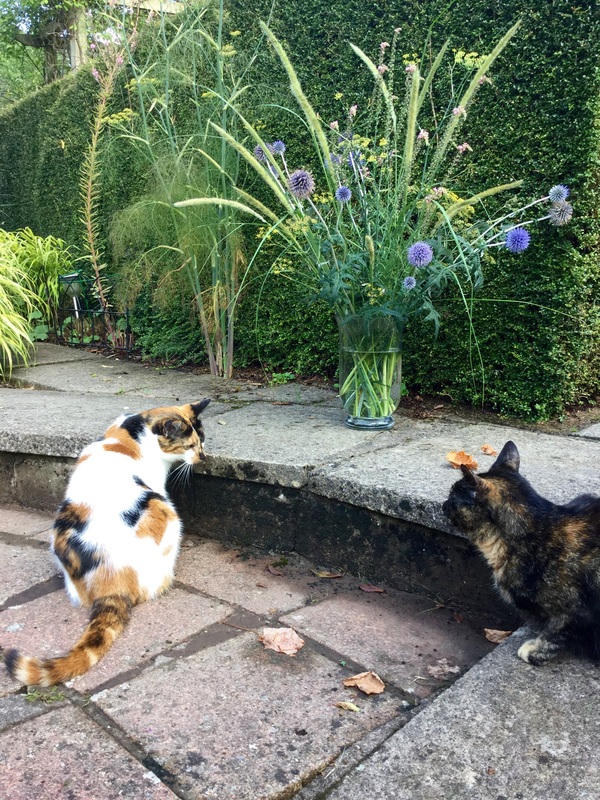 Even the cats seem to agree, these days it’s all too easy to be distracted by flowers, but back in 2011 the first clue that raised my eyebrows was the mat of roots encircling the bottom of the pot …. 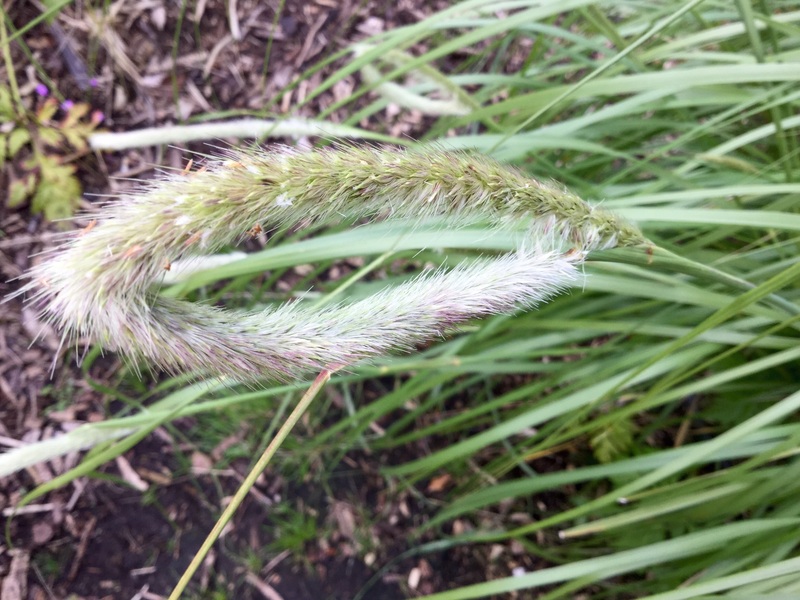 Evidently, this was a grass that might need watching, if used with a little care, it could be a great addition to the garden. Gardening in a field, as I describe it, makes me look kindly on plants that can give the cooch grass and creeping buttercups a run for their money. 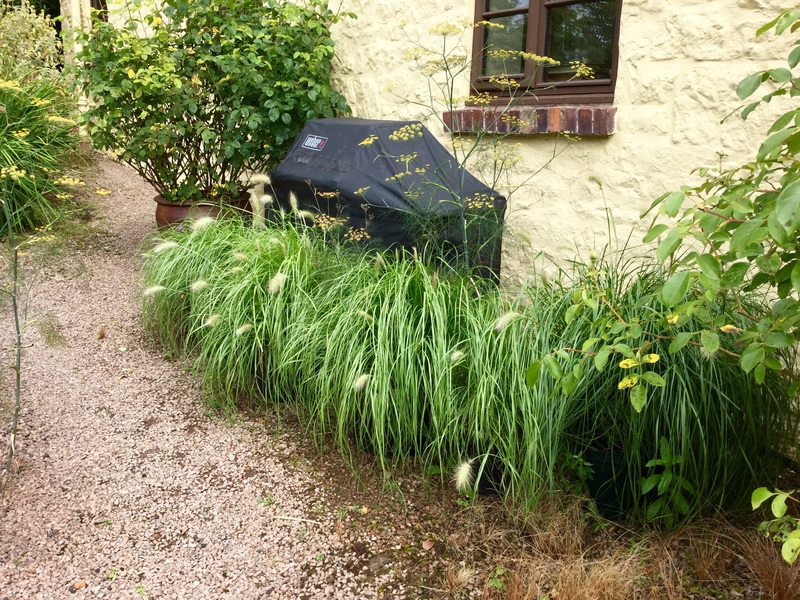 Like many grasses, pennisetum looks stunning grown en mass which for me means it must be easy to propagate in order to afford the numbers required. Failing that, it looked as though this statuesque pennisetum would excel as pot specimens on the terrace. With roots like boot laces, it didn’t seem the sort of thing to add to a mixed planting of delicate treasures. Four years later the pair planted in a sunny spot either side of the little bench are mature at a height of about 5 feet in flower. Admittedly the bench is swamped by a profusion of flowers. I plunge-planted the two 2 litre pots in 50 litre bottomless plastic containers to act as cuffs against wayward growth and they’ve behaved impeccably. (Cutting a vertical slit in the pot makes it much easier to wrangle plants out of the ground). Although the holes were back filled with John Innes number 3 plus lots of grit, the underlying soil in this part of the garden has pockets of sticky greenish-blue-grey clay, the sort that whiffs of something nasty. The silvery foliage is a sheer delight. 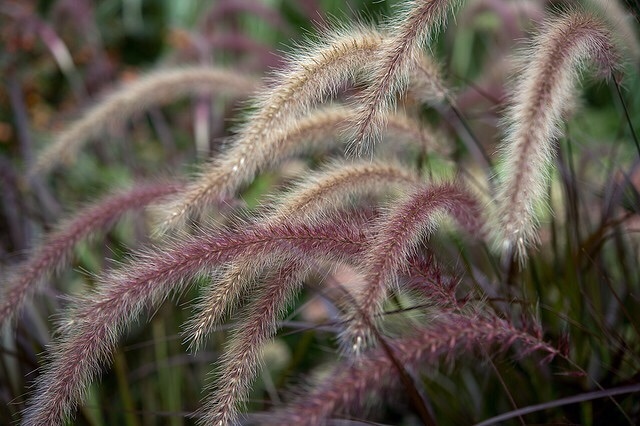 Reading about Pennisetum macrourum I came across queries regarding its hardiness, when I read in a seed catalogue that its cousin Pennisetum macrourum ‘Tail Feathers’ might be best ‘grown as annual’ the alarm bells sounded. I’ve had miserable experiences of loving and loosing too many related species, most memorably the tender but gorgeous burgundy leaved, red flowered Pennisetum setaceum ‘Rubrum’ as well its apparently half-hardy cultivar ‘Fireworks’. Despite all my efforts to overwinter ‘Rubrum’ in the cosy greenhouse, it’s either died or looked sickly the following year. Lots of pennisetums are fully hardy in most parts of the UK, sadly this isn’t one of them, not at least in the damp Welsh borders, but if I bump into a good one I’m likely to swoop it up as an annual treat. 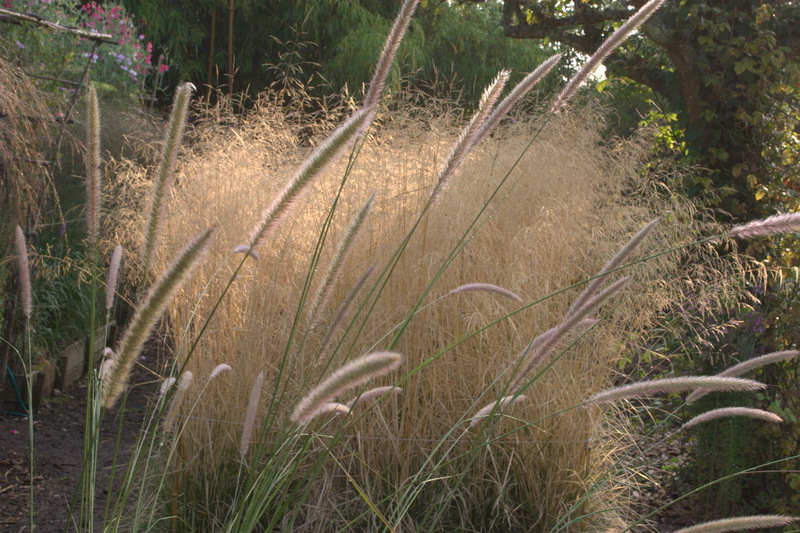 I’ve a growing collection of another borderline hardy one, Pennisetum villosum, which in my dreams and more southerly gardens drips with these beautifully fluffy cream flowers. It frustrates me for overwintering so well in the greenhouse that they have to be divided each year, but even between several large pots only produce a handful of flowers. This year despite villosum enjoying the sunniest west wall against which to bask the late August display is hardly floriferous. 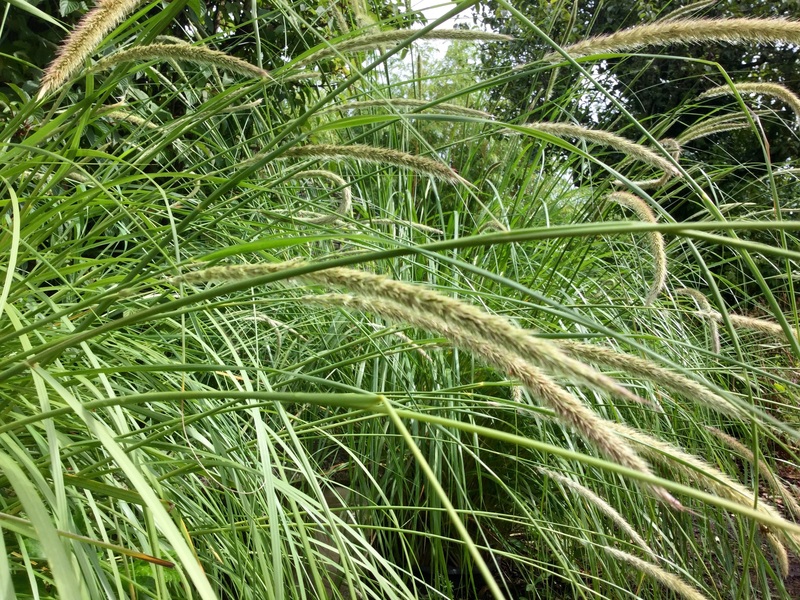 I live in hope, after all, some species of pennisetum are especially late to flower and I can see lots of villoum’s emergent flower spikes – despite the overcast weather they are still bravely flowering. Late flowering in itself doesn’t make a plant ungarden-worthy, in fact, it may be an asset. The foliage of Pennisetum villosum is a pleasant mid-green but in cool grey climates it takes quite a long time to form these lax mounds. Even so, I haven’t the heart to folllow the advice of “When in doubt, throw it out!”. At this rate I’ll end up with a flowerless field full … and a polytunnel? 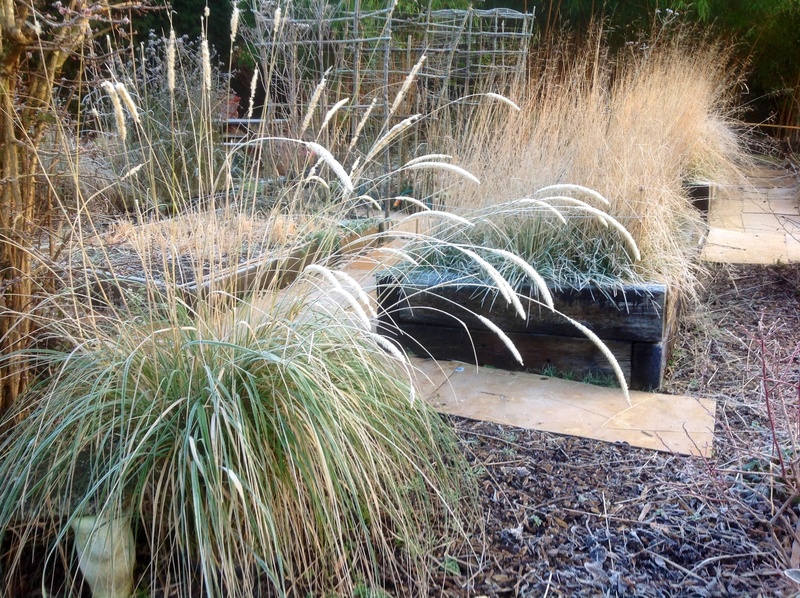 In comparison Pennisetum macrourum never looked like a pernickety plant, its strong fountain of strap-like silvery grey-green leaves looked and felt resilient enough to take its chances in the nursery for the winter. Given the cold, wet winter with temperatures down to -10 I was surprised to see both plants had made it through unscathed and still had lots of green leaves. Perhaps it hadn’t read its care label, coming from South Africa where it’s known as the Veld Grass, it’s not meant to withstand less than -5. Maybe this is a bit conservative, especially for mature plants? All things considered, I was impressed and encouraged, who knows, maybe next year I’ll let it run free? Last summer, we revisited Knoll Gardens, this time enroute to Apple Court where Roger Grounds and his wife Diana Grenfell created a wonderful garden and from which they ran their nursery specialising respectively in ornamental grasses, hemerocallis and hostas. Sadly, the garden is closed to the public this year, the website gives a glimpse of the beautiful interconnecting areas of the compact one acre walled garden. It was another lovely day, befitting of another grassy souvenir : this time, an exciting new release, the dwarf Pennisetum macrourum ‘Short Stuff’. Discovered by Neil Lucas as a chance seedling in his nursery at Knoll Gardens, he wrote an informative and beautifully illustrated post about this plant last year ‘Size Matters’. It raises eyebrows too, for all the right reasons. A great post. I love Pennisetum too and like you, I have lost’ rubrum’ in the past. This year I fell for ‘ Fireworks’ even though I know I will probably lose it, in the meantime it is fabulous in a pot. On the other hand P. villosum came through the winter quite happily. But then we did have a mild winter. Yes, the species setaceum is very desirable! As long as we know which species we’re growing and what care it requires over winter that’s fine – conditions vary even within the UK. Looking at villosum again today between showers it’s trying hard to flower freely, so in my garden a warm west wall seems to be key. I have bought and lost so many Pennisetum that I think I may have given up for now. There is one I admire at Polesden Lacey that comes back year after year but it isn’t labelled as far as I can see. Of course it is growing on chalk in a sunny south- facing border so ideal conditions. Maybe I should try one last time and grow it in a pot. If you can send me an image maybe we can identify at least the species? kate.patel@btinternet.com I’m sorry you’ve lost many pennisetums, I have too in my time, and it’s sad as they are very beautiful. It’s important to know the species in order to decide on its hardiness for your conditions – orientale and alopecuroides should be hardy for much of the UK. Pots are a great way to hedge bets – bring them in when temperatures drop, as a rule of thumb anything in a pot is less hardy by 5C. Enormously helpful post-thank you. 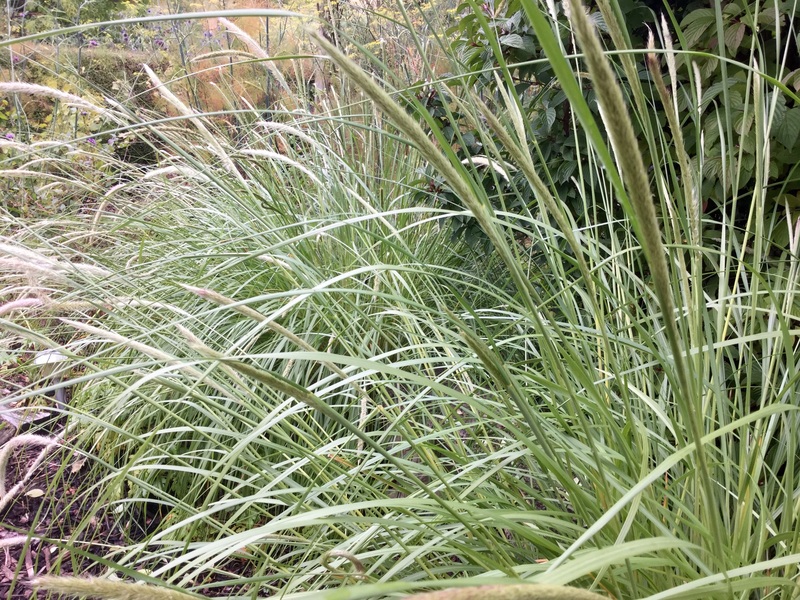 I love grasses and need to learn more just in case my two large box parterres turn out to be suffering from blight. 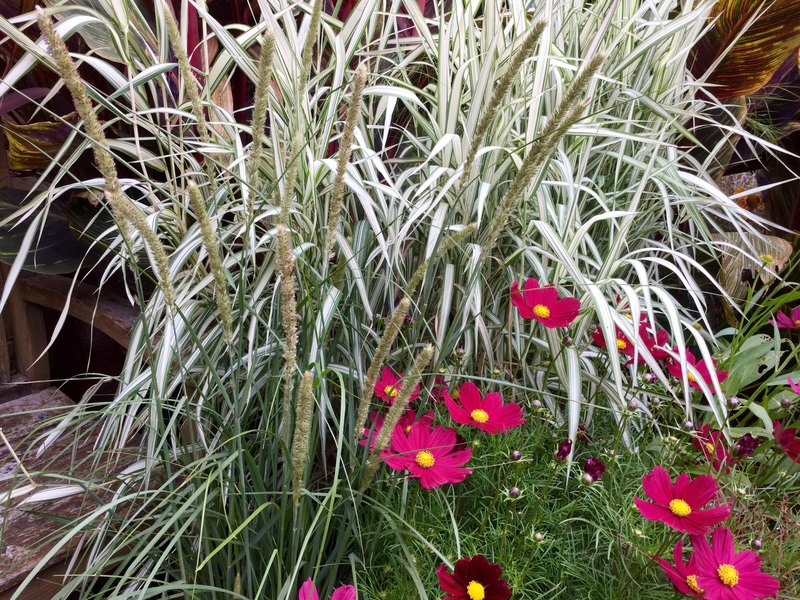 I will certainly combine grasses and herbaceous in the event of a major re-design. Thank you, it’s nice if the post helps a bit. Sorry to hear about your parterres, Anne Wareham, Veddw Garden is an authority on how to deal with box blight may be worth emailing her for advice? I love Pennisetums but my only experience has been the ‘Rubrum’ which was sold to me as hardy. Naughty garden centres have a lot to answer for int terms of putting people off plants. I’m sure there are many gardeners who think it’s something they’ve done. Whoops! Pressed send before I was finished. ;) I love ‘Red Buttons’. They have a whole bed planted with it at Kiftsgate, edging a path like you would use lavender. It looked fantastic. They had a lot of it at Hillier’s too. I wonder how hardy it is. Hope we’re in for a drier spell of weather. Have a lovely weekend. I’ve not tried P. thunbergii ‘Red Buttons’ (yet!) and I’m not familiar with the species. It looks gorgeous, and I can see it working well as an edging as you describe and in flower arrangements. 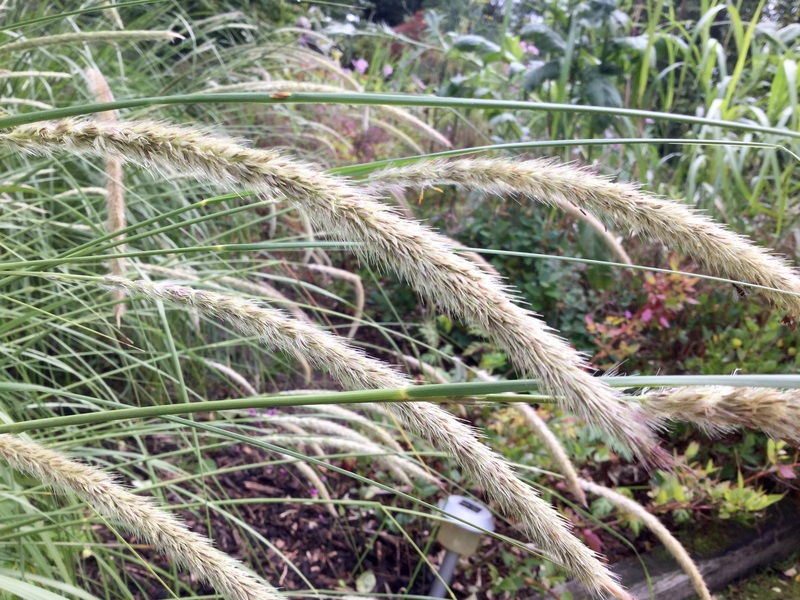 Until I met macrourm I’d have said the hardiest pennisetum to grow where I live, in my conditions etc are the species orientale and alopecuroides – I’ll do a post on the latter when they are in flower. Sunshine at last this afternoon! 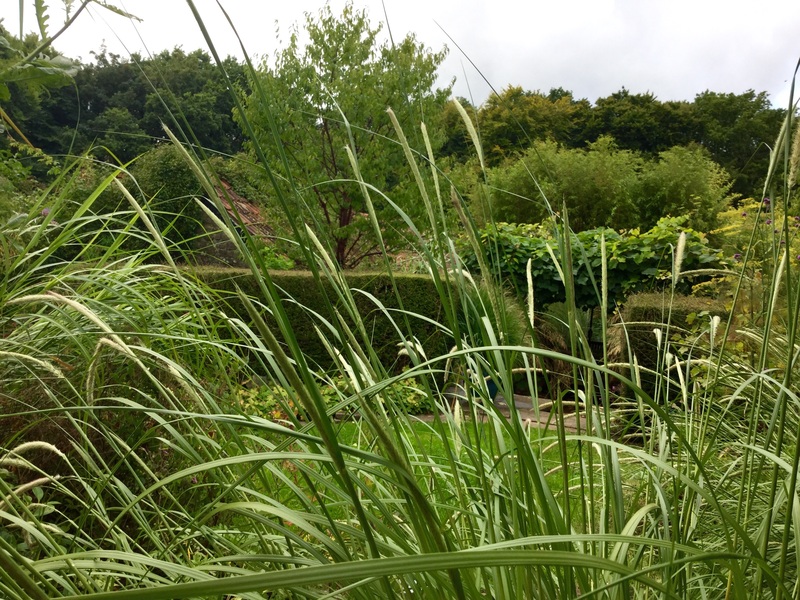 Kate your garden looks absolutely beautiful with it’s mature grasses. I try to check the plant origins before selecting them for my garden. If they are from North America/Asia/China then there’s a good chance that they will survive here. Some Pennisetums come from Africa and cannot cope with our winters. Even though I know all that that I still buy them on impulse at the garden centre… they are so beautiful…who can resist? These days I tend to pop them in a big patio pot and treat them like autumn bedding. They cost a few pounds and last a few months so I think that’s value for money. Thank you Gillian, many grasses mature so quickly. Checking out where plants come from and the conditions in which they naturally thrive is sensible, I’m often tempted by an unmown tender beauty especially at this time of year! How sensible Cathy, that’s what I said back in 2002!